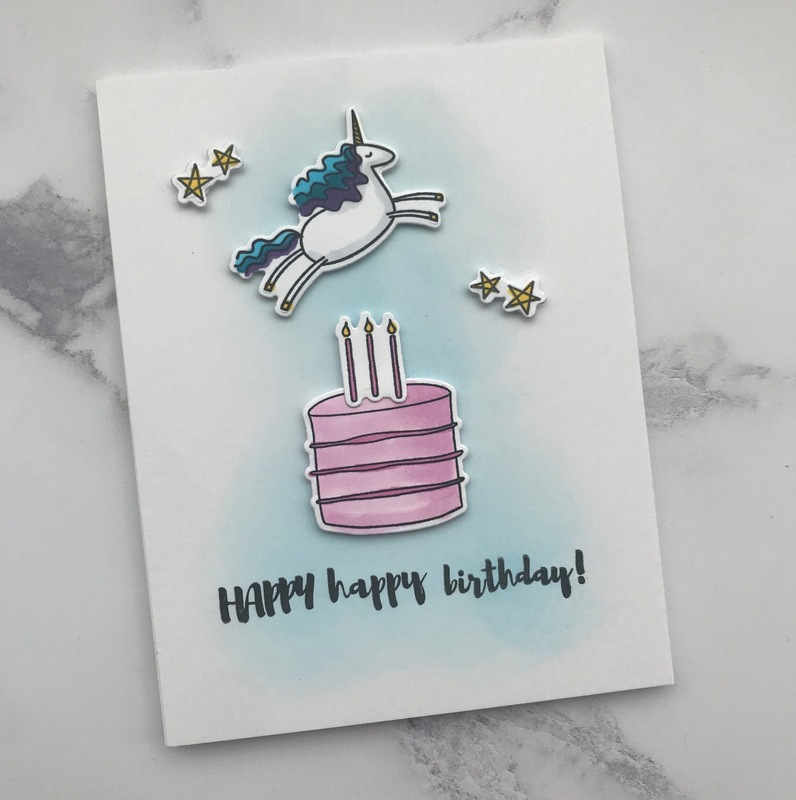 Happy, Happy Birthday: Unicorns and Birthday Cake! What could be any more wonderful than having a unicorn and pink cake for your birthday! I got the inspiration for this whimsical card from several Essentials by Ellen stamps. I think the leaping unicorn is so cute and the fine lined images all coordinate well with each other even though they are from different stamp sets. Stamp the images onto Neenah Solar White 80# cardstock using Memento Tuxedo Black ink or any Copic-friendly black ink. Color the images using Copic markers. Die-cut the unicorn, cake, candles and stars from their respective stamp sets. Onto an A2-sized piece of Strathmore Bristol Smooth paper, lightly blend a background using Distress Oxide ink and a foam ink blending tool. Arrange the die-cut images on the card, but don’t adhere. This must be done to determine the placement of the birthday sentiment at the bottom of the card. Once the sentiment location has been determined, stamp the sentiment in black ink. Adhere all the image pieces using foam tape for dimension. Hope you like the project. Have a great day filled with unicorns, cake and stars. Unfortunately, I left out the sprinkles, but you can add them on your own! This entry was posted in Birthday, Critters and tagged Ellen Hutson, Essentials by Ellen. Bookmark the permalink. Thanks! Glad that you liked the card.